I was living in New York City during the horrific 9/11 terror attacks, just over ten years ago. I knew one woman who was killed in the attacks, many people who had personal stories of survival, and some others who lost friends or relatives. In the aftermath, I did some volunteering of a religious nature as well. Thus, I am extremely proud of the fact that Israel features an official 9/11 memorial monument, and one that is both beautiful, well-placed and unique. There are, in fact, many 9/11 memorials scattered around the world (though of course the bulk are in the U.S.), but this one, in Jerusalem, is exceptional. 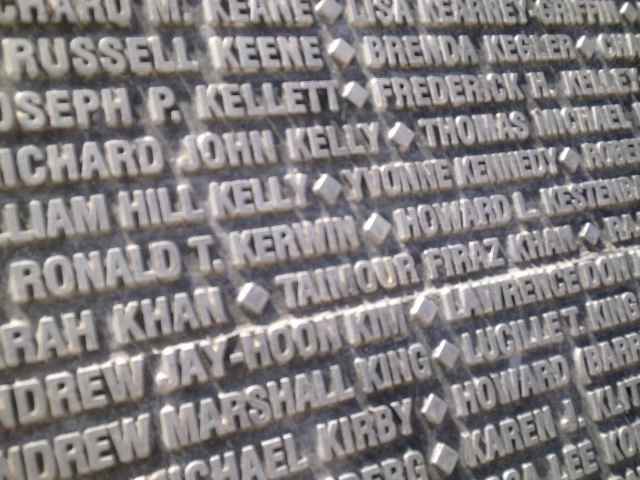 It is the only memorial outside the U.S. to feature the names of all 2,980 victims of those terror attacks. This is why the picture I chose was one that focused on the names. Israel understands that the focus of our attention when viewing acts of terror should have very little to do with the terrorists or their motivations, and should instead focus on the innocent victims. The victims who are individual human beings with names, families, stories, lives and the potentials to better the world that terrorists rob them of. 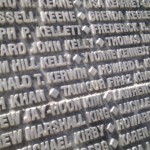 The few names that you can make out in part or whole in my photo barely scrape the surface of the diversity and individuality of the victims of 9/11. But it at least begins to capture this concept. The Jerusalem 9/11 Memorial Monument is situated in a secluded area on the outskirts of the city, at the edge of a forest and on the side of a hill. This placement is a bit of a double-edged sword. On the one hand, its location and peaceful surroundings fosters quiet meditation when one visits the memorial. But at the same time, it is a bit of a difficult to reach location, meaning that only those who make a point of going there will actually see it. In my opinion, it is worth visiting, and I hope to bring tourists there in the future despite the remote location. Either way, it is possible to at least see the area and talk about it without visiting there. As one enters Jerusalem on the main highway (Highway 1) from Tel Aviv, driving up the road from the Motza area, the main cemetery currently used by Jerusalemites (Har Menuchot) is above you on the right. If you look to your left, across the valley and below the area of the neighborhood of Ramot, you will be able to see the clearing in which the monument sits. The area is also fairly close to the new Tel Aviv-Jerusalem train that is due to be completed in another 6-8 years, and it is my hope that the monument will be visible as rail commuters come in and out of Jerusalem. Also, a recently opened bike path runs just beneath the area, so hopefully some bikers will make the slight detour to visit as well. Designed by Israeli artist Eliezer Weishoff, the memorial is made up of a number of different parts. The moderate-sized plaza itself is a crater-like depression, and the side that faces across the valley towards Highway 1 and the Jewish cemetery is where the plaques with the victims’ names are located. But the literal and visual centerpiece of the monument is a 30-foot high bronze sculpture of an American flag blowing in the wind. The way it rises upwards is designed to also resemble a flame, appropriate both as a memorial to the fires that burnt at Ground Zero and as the traditional Jewish way of memorializing the dead. The base of the sculpture is made of dark granite, but the front features a plexiglass window, inside of which sits a piece of one of the girders of the World Trade Center, brought here from Ground Zero. 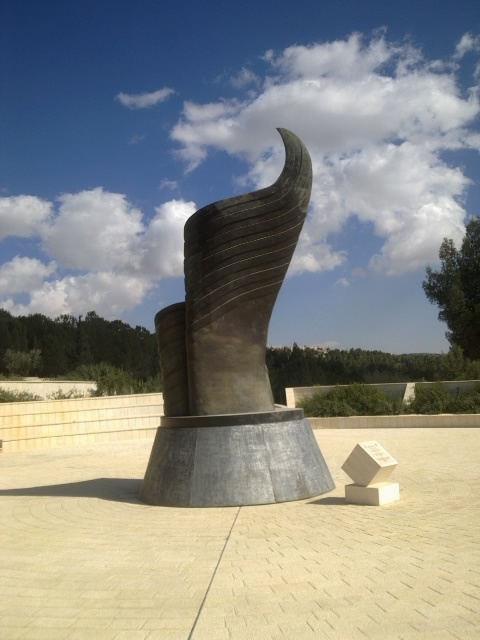 Ultimately, Jerusalem’s 9/11 Memorial is a very tasteful, thought-provoking and meditative monument. As an Israeli and an American, I am very proud that my new country saw fit to recognize the tragedy that affected our closest friend and ally among the nations of the world. And I want those who come visit to recognize that recognition, and know that we are partnered in the fight against global terror. I encourage you to take the extra time required to visit this monument when you next visit Jerusalem! Could it be from the Tunisian shul in Akko? 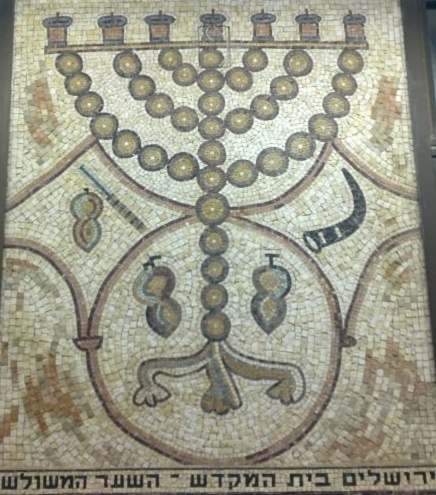 As it is a mosaic, most of the mosaics I’ve seen have been around the Sea of Galilee. I have a memory of a synagogue that was uncovered just south of Tiberias. I recall that there was an elaborate Zodiac there, but there could have just as easily been an extra panel for Jerusalem. So my guess is “a mosaic somewhere in the Galilee”, but the frame that is visible on the edge makes me seriously doubt myself. 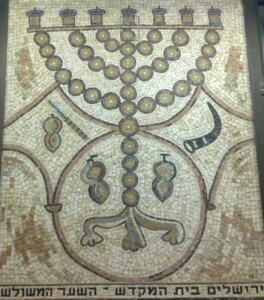 That’ll be part of mosaic synagogue in the new city of Acco.